“A few drinks later and a plan had been hatched to build a new one. ‘All’ we needed to do was acquire a carriage underframe, cut out the middle, join the two ends together and construct a new body! 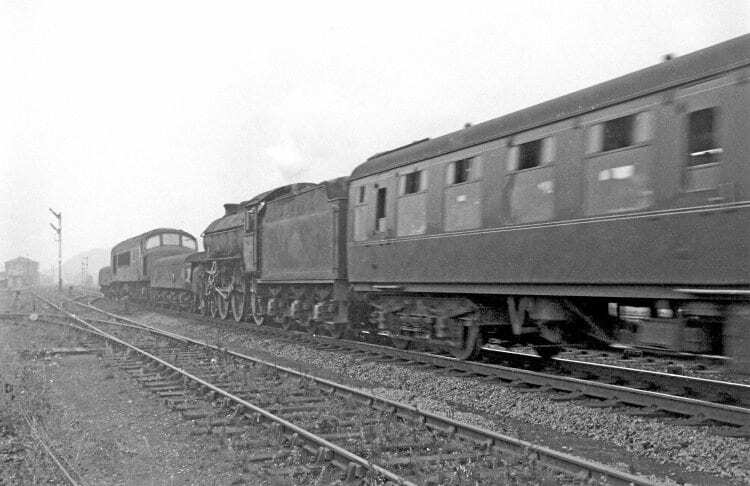 ex-LNER and LMS examples) as donor vehicles, but when the team came to research the history of the fleet, they found an alarming lack of information – technical drawings were scarce, photos of the vehicles under construction appeared to be non-existent and there was very little printed work on the subject. “In fact, by far the most valuable details and illustrations were contained in feature articles published by The Railway Magazine in December 1995 and June 1996,” revealed Brian. The original vehicles had been numbered B964000 to B964121 and had been built in the early-1960s to four different diagrams by three BR workshops and four outside contractors (see panel). The diagrams were 1/555, 6, 7 and 8, many utilising Gresley bogies, but as the 21st century brake tender could not be exactly the same as its predecessors, it was decided to allocate an all-new diagram of 1/559 and the running number B964122. By May 2011, a set of dimensions had been located by the National Railway Museum, enabling group member Mick Yates – a draughtsman by trade – to produce a set of computer-aided drawings suitably revised for use with a Mk1 body and BR1 bogies. At RVP’s Rothley base, a start was made on dismantling the donor coach (SK No. 15208). 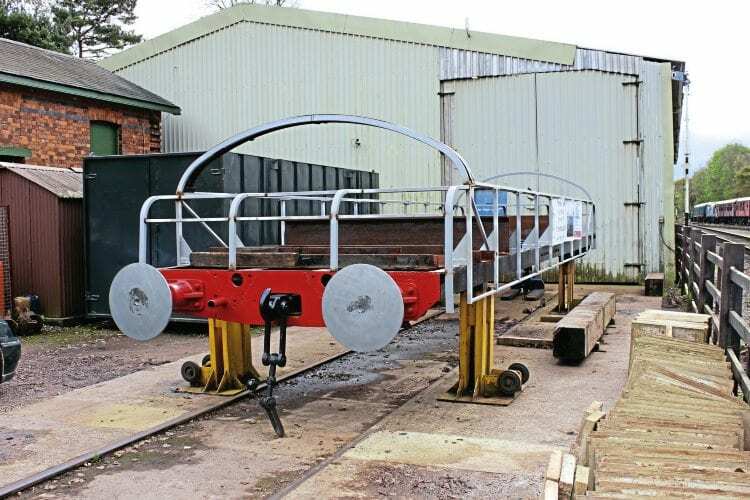 The body and remaining fittings were removed, the centre section was cut from its 64ft-long underframe and the two end sections were cleaned and painted before being spliced and bolted firmly together to produce a 32ft 2in frame. The group had chosen the name ‘Project X’ for its scheme as it wanted to keep the plan quiet until the initial hurdles had been overcome, but after a year or so the members felt confident enough to go public. The date chosen to issue a press release was April 1, 2012, but the decision back-fired somewhat as most people assumed the announcement was an April Fool spoof and didn’t take it seriously. “It did at least get people talking about us, so in the end it wasn’t such a bad decision after all,” recalled Brian. 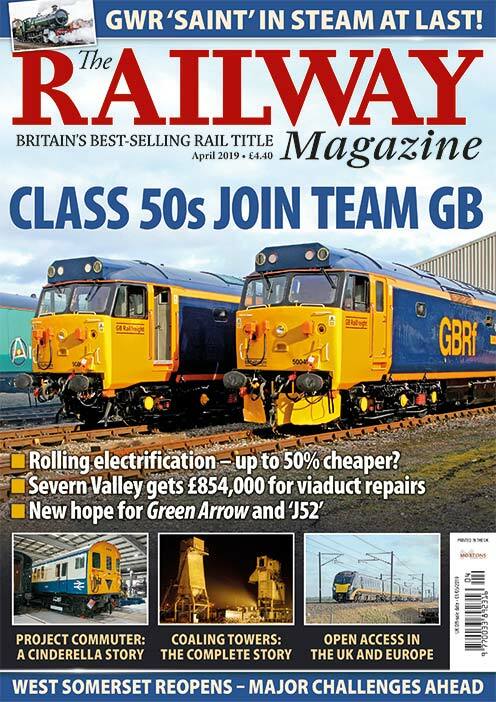 It soon became clear that the joke was on the cynics, however, and half a decade of hard work culminated in December 2016 with the final piece of bodywork fitted to the vehicle ahead of an official launch into traffic at the GCR’s September gala this year. Although it had been possible to acquire components such as brake cylinders from donor vehicles, a large number of metal parts – including the body panels and supporting roof hoops – had to be fabricated from scratch and much of this work was carried out by the group’s Phil Stanbridge. The employer even allowed an expensive and newly acquired lathe machine to be tested out on brake tender work free of charge. Another lucky break concerned the all-important ballast weights required for the tender’s successful operation. 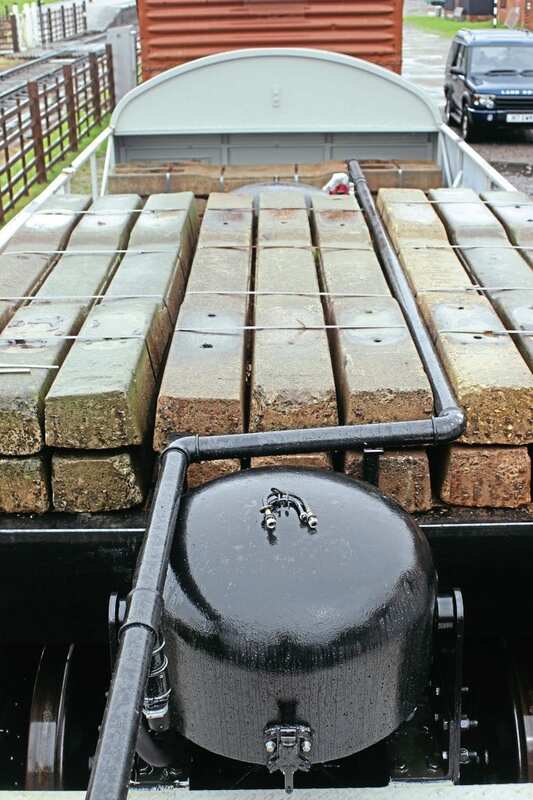 BR’s original vehicles mainly contained scrap iron or poured concrete as ballast, but a conversation with Nick Tinsley, of the GCR’s permanent way team, revealed the existence of a pile of unwanted concrete sleepers in Quorn yard. Fitted with bullhead chairs, they were non-standard and it was thus agreed that 48 of them could be moved to Rothley – but the volunteer signalman at Quorn thought they were being stolen and phoned Loughborough headquarters to inform the general manager, who duly made contact to double-check what was going on. “It was a bit embarrassing but at least the signalman took the precaution of informing someone of an activity he thought suspicious,” said Brian. The sleepers were duly fork-lifted onto the frames of the DBT and have proved ideal for their new purpose. Some have been placed lengthwise inside the vehicle and others have been cut to size to fit side-to-side. All have been carefully strapped down and bolted to ensure there is no shifting of the load should the tender be involved in a heavy shunt or some other incident. The amount of ballast used had to be accurately calculated as it was necessary to bring the vehicle’s springs down to their correct riding height to ensure that the tender’s buffers line up with those of the locomotives it will be paired with in traffic. The total weight when up and running will be 35.5 tons – the same as the majority of the originals. The cost of building the vehicle has been largely met by the group members themselves, aided by a small number of donations. “We all chipped in to raise the initial £1,000 required to purchase the Mk1 coach and since then it’s been a case of emptying our wallets whenever anything needed buying,” explained Brian. 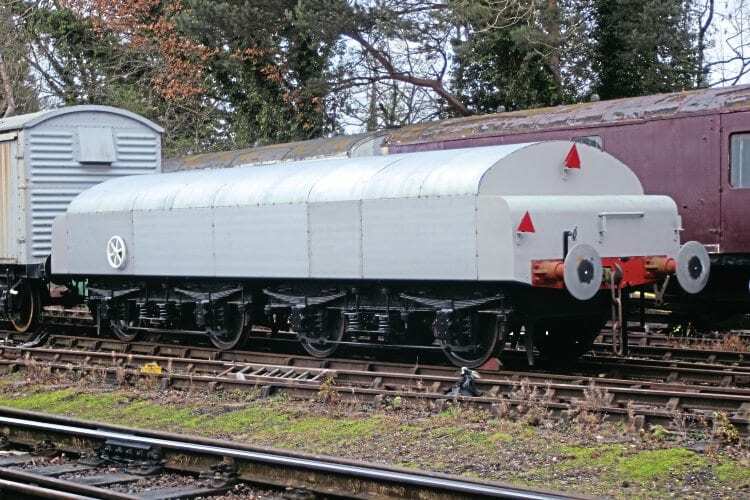 It is planned to launch the tender into traffic at the GCR’s September gala, although engine drivers will need to be trained to handle the extra weight, length and braking power as the tender will officially be considered part of whatever locomotive it is coupled to. 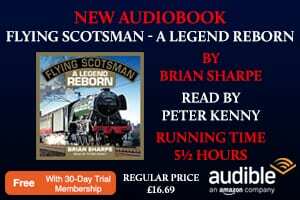 Parts of the railway’s rulebook will thus need to be re-written and a number of test runs and driver-training sessions will be necessary, so the group is appealing for ex-BR men with experience of DBTs to come forward with offers of assistance and advice. After the launch, No. B964122 is likely to be in great demand for photographers’ charters and RVP would also be happy to listen to offers from any other heritage railways wishing to operate this unique vehicle on their own metals. ■ Brake tender donations can be made to: RVP Ltd, 26 Cliff Park Avenue, Wakefield WF1 2DW. (Please write ‘Project X’ on the back of cheques) or text RVPL10 £10 to 70070. Ex-BR drivers are invited to contact Brian Hallett on brian-hallett@sky.com or tel 01778 346728. THE transition from steam to diesel on British Railways caused major changes, one of which concerned the safe control of heavy unfitted goods trains. 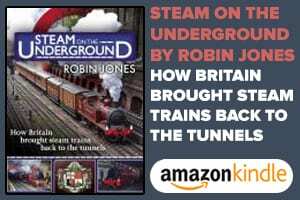 Whereas a steam locomotive was able to use its driving wheels and tender wheels for braking, the new forms of traction could rely only on a limited number of small diameter wheelsets. Following a spate of problems with Bo-Bo and even 1-Co-Co-1 diesels, three prototype brake tenders were built by Glasgow’s Cowlairs Works in 1960/61. 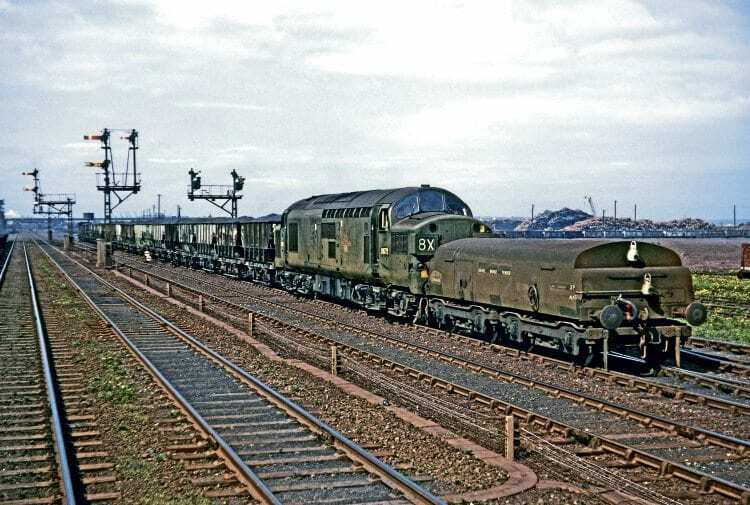 Numbered DE320848 and DE320922/23, the 35½-ton vehicles proved so successful in trials that BR decided to place orders for a fleet of a further 119 for deployment across the national network. Two other BR works (York and Stratford) and four private wagon-building companies – Standard, Central, Marcroft and Derbyshire – were contracted to produce the fleet, and all but 10 of the vehicles were outshopped in 1962/63, the remainder following in 1964. Their low body height enabled them to be pushed as well as pulled by locomotives, although maximum permitted speed was reduced from 60mph to 45mph when being propelled. Fitted with twin vacuum brake cylinders, they not only improved braking power on totally unfitted trains but also increased the braking efficiency of a train with a ‘fitted head’ (one containing a portion of braked wagons). 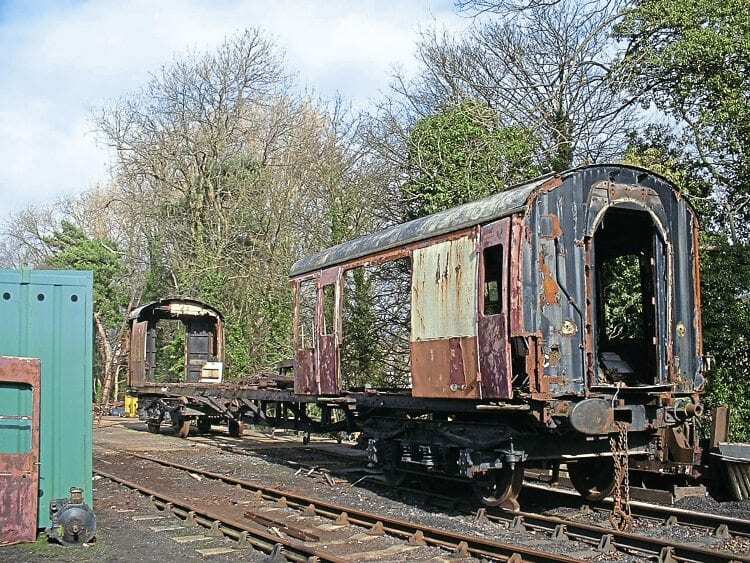 Construction costs were kept to a minimum by the use of redundant coaching stock bogies, frames and brake gear, with only the steel platework being new. In most cases this was of a smooth-curved design, resulting from re-use of former carriage roof supports, but the 10 DBTs built by Stratford were larger versions of the first Cowlairs prototype in having a square-edged, rivetted appearance more akin to a First World War battleship. At 37.5 tons, the Stratford products were two tons heavier than their classmates. The number range for the fleet was B964000 to B964121, with the three Scottish ones being renumbered into that series to make a grand total of 122. Details of the various diagram builders can be seen in the accompanying table, with Diagram 1/555 being the most common at 78 vehicles, most of which ran on ex-LNER Gresley bogies. The two Diagram 557 vehicles had BR bogies and most of the remainder possessed ex-LMS versions. 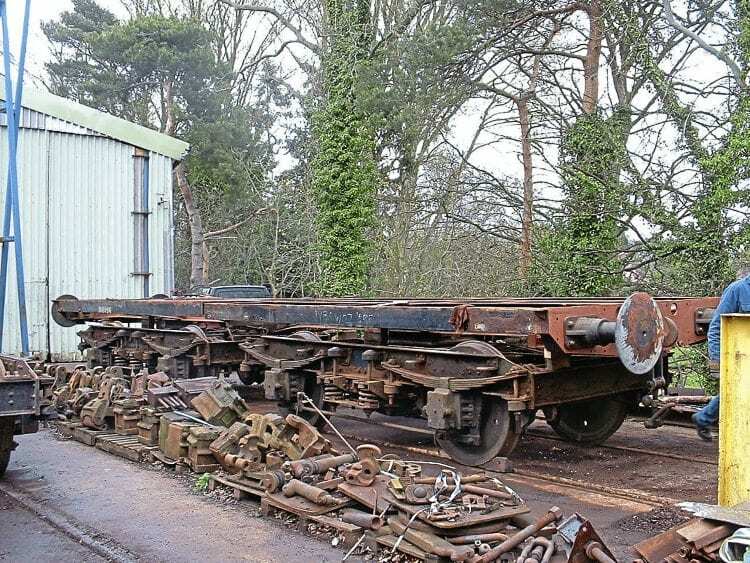 Once the shortened frame had been lifted from its bogies, it was placed on stands outside Rothley carriage shed to enable the body-supporting framework to be fitted. Note the large Oleo buffers, with which most, if not all, the original DBTs were fitted. 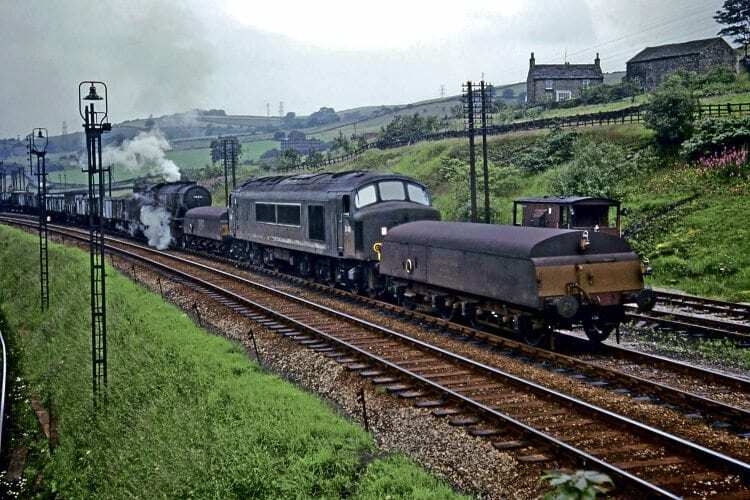 The tenders were widely used on all Regions of BR, especially on mineral trains in the Midland and Northern coalfields, and it was not uncommon to see a loco working with two, one pushed and the other pulled. cross-London freights, and it was not unknown for tenders to be paired with AC electrics and even steam locomotives, although the latter were extremely rare. DBTs were technically classed as wagons, but were always counted as part of a locomotive when in use and would be completely under the control of the driver/secondman, not the guard. Most were fitted with handbrake wheels on both sides and for the purposes of load computation, each vehicle was regarded as equal in weight to three and a half of BR’s standard wagon units and equal in length to one and a half standard wagon units. Under no circumstances were brake tenders permitted to be loose-shunted. 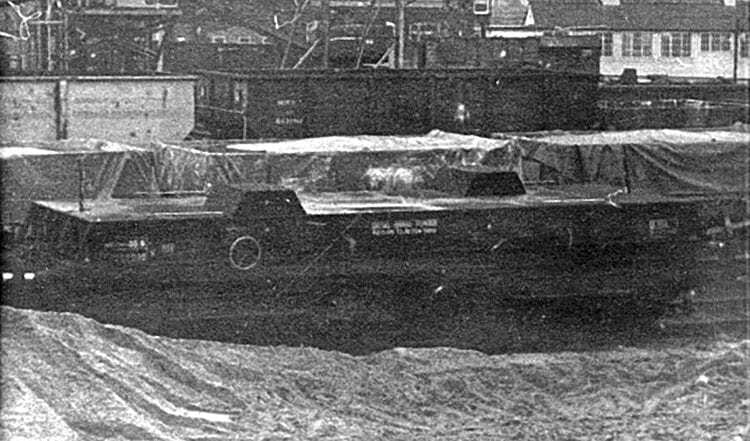 The benefits of the fleet far outweighed the disadvantages, but among the latter was the fact that their deadweight reduced the payload of a train while increasing its length. 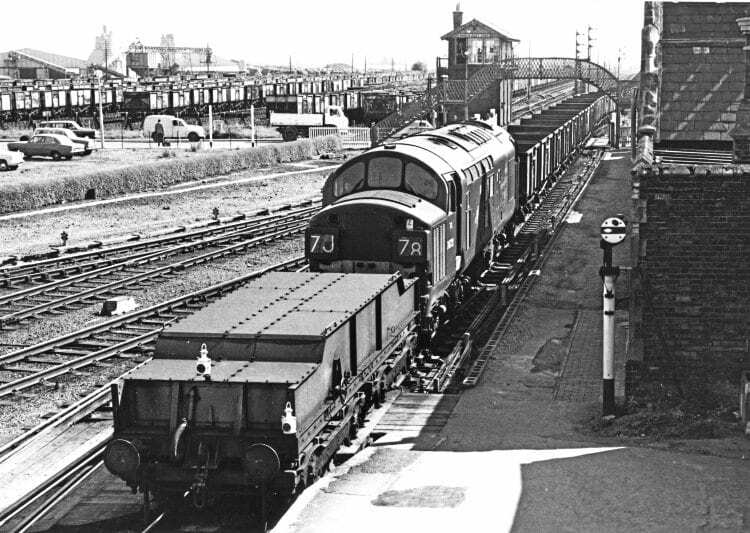 Special operating procedures had to be introduced, which complicated traffic control, and as freight trains generally became faster, the propelling of brake tenders was abolished by BR from 1970 onwards. That decision also removed a risk from the network, as there had been a few incidences of drivers misjudging the length of the tenders when stopping at signals. Several did, however, see regular use on Western Region civil engineers trains in the middle-to-late 1970s and no fewer than three were noted coupled behind Class 37 locos Nos. 37222/238 on a train of rail sections passing Newport, South Wales, in March 1979. 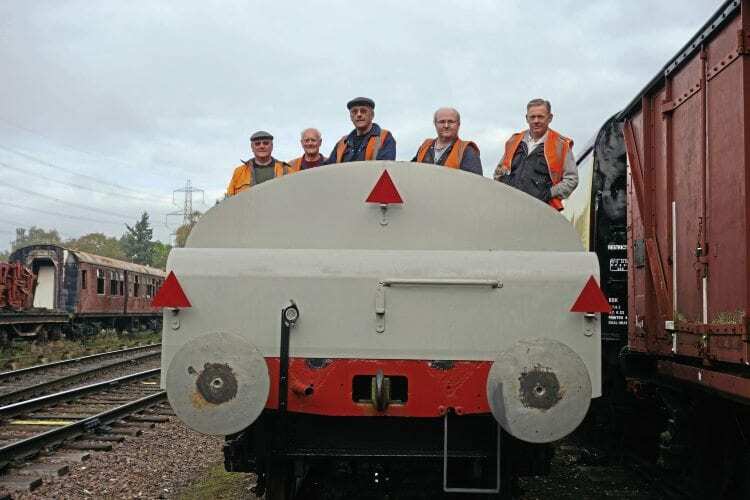 In June of that year, two were pictured in the Eastern Region’s Temple Mills marshalling yard. A dozen or so were transferred into departmental stock (renumbered into the DE3209XX series) and survived into the early-1980s. By that time, most had received BR blue livery in place of the original green. By 1980, the survivors were concentrated in the Acton and Taunton areas and at least two of those – the former B964017 and B964050 – were noted awaiting the cutter’s torch in Woodham’s Barry scrapyard in mid-1981.